Ethylenepropylene based rubbers are forms of non-polar synthetic rubbers. EPM (sometimes also known as EP) rubber is based on ethylene and propylene monomers, with no unsaturation (carbon-carbon double bonds) present. EPDM is also based on the same constituent monomers, however as no unsaturation is present in the backbone, it is added as a third monomer pendent to the main chain. EPDM materials can be cured with either sulphur or peroxide; sulphur offers improved mechanical properties and peroxide enhanced heat stability. 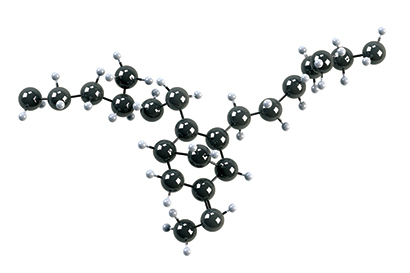 EPM rubber can only be cured using free-radicals (peroxide or radiation curing). As the polymer chains of both EPM and EPDM have completely saturated hydrocarbon backbones, excellent ozone resistance and very good resistance to heat and oxidation are achieved. Sulphur cured grades offer a typical temperature range of –50°C to +120°C and optimal mechanical properties. Peroxide-cured grades can reach a maximum temperature of approximately +150°C in hot water, alcohols, organic and inorganic acids and bases. Being non-polar elastomers, EPM and EPDM offer good performance in polar fluids such as alcohols, water, steam, coolants etc., but perform badly in nonpolar fluids such as hydrocarbon oils, lubricants and greases.